Carton flow is ideal for quick picking and shipping of individual carton products. Many options exist for carton flow design. The team at Morrison Company has the experience and manufacturing partnerships needed to create a unique system to achieve your warehouse goals for efficiency, cost effectiveness and storage maximization. 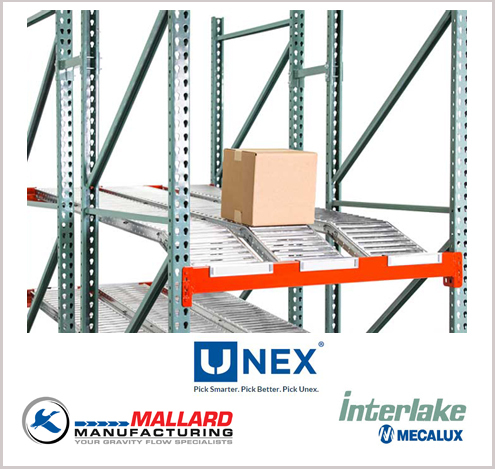 Based upon case size, case weight, product movement and restocking needs, we will recommend a stationary, portable or drop-in carton flow system by Unex®. With the patented Span-Track line of products, your case flow will handle full or split-case pick needs for any capacity, size or number of SKUs without track hang-ups and restocking down-time.